Frankie Dettori wins his SIXTH Royal Ascot Gold Cup on board Stradivarius! One of racing's greatest trainers landed his first G1 Gold Cup at Royal Ascot today. The famous race was a rare omission from the illustrious CV of Newmarket-based John Gosden, but the four-year-old colt Stradivarius, owned and bred by Bjorn Nielsen and ridden by the inimitable Frankie Dettori, filled the vacancy in style. Stradivarius tracked his 7/4 joint-favourite, Order Of St George into the straight, but when that rival appeared to be emptying and Torcedor (14/1) went on, Dettori was alert to the danger and headed in pursuit. He drove his mount past Torcedor and then had enough in reserve to hold the late-challenging French runner Vazirabad (9/2), who loomed as a danger, had every chance, but was fighting a losing battle near the line as the winner began to inch away. Vazirabad, ridden by Christophe Soumillon, took second, beaten three-quarters of a length, and there was a head back to Torcedor in third. Order Of St George, who won the Gold Cup in 2016 and was second last year had to be content with fourth. Gosden said: "It was an extraordinary race. Frankie said they didn't go that quick, and his heels were definitely down early on, which meant the horse was taking him on. "Frankie got himself out of a pocket, which was essential with the pacemaker coming back, and got himself in the perfect position. But as usual, Mr Soumillon was waiting like all good Frenchman to pounce late and frustrate us. "What an exciting finish that was - and look at the line-up as they headed to the line. That's a pretty smart front four. "It was a fascinating tactical race, because if Frankie had gone too soon there was the danger that Vazirabad would nail him - if he had committed to kill off a rival at the furlong pole the French could have come along to collect the prize so he had to be careful of that." Stradivarius had not run over today's stamina-testing trip of two and a half miles, although he had won the G1 Goodwood Cup last year over two miles, as well as being placed in the G1 St Leger. Fears about his stamina for the Gold Cup began to evaporate inside the final furlong as he ran to the line tenaciously. Gosden said: "He did see it out and he was going away at the finish. He's a proper little staying horse that we call Mighty Mouse because he's not very big - he looks a bit like a mini Trigger with his four white feet, but he is a gorgeous horse. He's done it really, really well, and loves this ground as he can flick off it and quicken well. "It's lovely to win the Gold Cup - I've had horses placed in it a few times." Stradivarius is a son of the great racehorse Sea The Stars, and Gosden said: "Mr Nielsen has bred horses for years, but it's interesting, you try to breed a Derby winner and end up with a Gold Cup winner." Stradivarius is now on track to land the W H Stayers' Million, a £1m bonus designed to encourage breeders and owners to produce and/or buy staying horses. He won one of four designated prep races in May and now needs to win the G1 Qatar Goodwood Cup and York's Weatherbys Hamilton Lonsdale Stakes to land the prize. 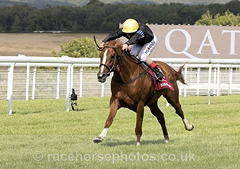 Gosden said: "He will go back to Goodwood next - he won the race last year - and then try for the Lonsdale Stakes. I've heard the bonus is well insured . . ."
Founded in 1807, the Gold Cup is one of the most prestigious races at Royal Ascot. At two miles and four furlongs, it thoroughly tests a horse’s stamina but is not the longest contest of the meeting, with that accolade going to the Queen Alexandra Stakes over nearly two miles and six furlongs on the final day. Master Jackey became the first horse to win the Gold Cup when, carrying only 6st 12lb, he beat three runners and thus collected 100 guineas in prize money for owner Mr Durand. Jannette, who triumphed at 4/5 in 1811, was the first odds-on winner. Numerous horses have gone off at prohibitive odds since, none shorter than Gay Crusader who won at 8/100 in 1917. Pretty Polly’s defeat by Bachelor’s Button in 1906 is arguably the race’s greatest upset. The brilliant 1904 Oaks winner seemed to be unsettled by the sweltering conditions and a wart on her belly. Winners of the Derby rarely run in the Gold Cup nowadays, but for much of its history, the race served as the primary objective after Epsom Classic glory. West Australian, the first winner of the Triple Crown (2,000 Guineas, Derby, St Leger), won at 4/6 in the hands of Alfred Day in 1854. The Flying Dutchman (1850), Gladiateur (1866) and Isinglass (1895) are other famous winners of both races. Ocean Swell, successful in 1945, is the last horse to have completed the Derby/Gold Cup double. The most recent winner of the Derby to take part was Blakeney, who finished runner-up in 1970. The Gold Cup is part of the QIPCO British Champions Series.